If you want a savory delicious chicken dish, you’ve got it. 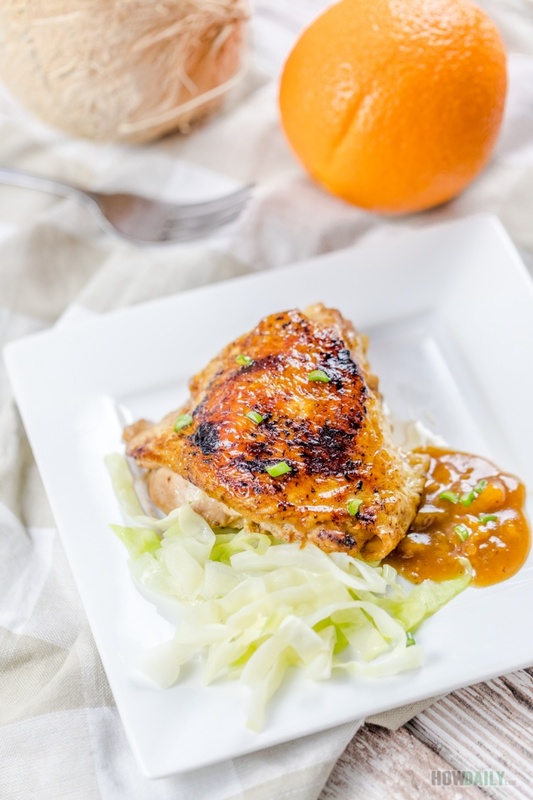 This coconut orange pan fried chicken is so crispy on the outside while tenderly juicy on the inside. First, the chicken is fully cooked with coconut water to ensure the of the natural sweetness and tendency. Chicken pieces are then pan fried to melt off extra fat while making their skin crispier. Finally cover with the tangy sweet sauce enhanced by orange flavor, this is definitely a meal to remember. For this recipe, chicken thigh with skin is the perfect choice, but you could also use drum sticks, wings or even breast meat. 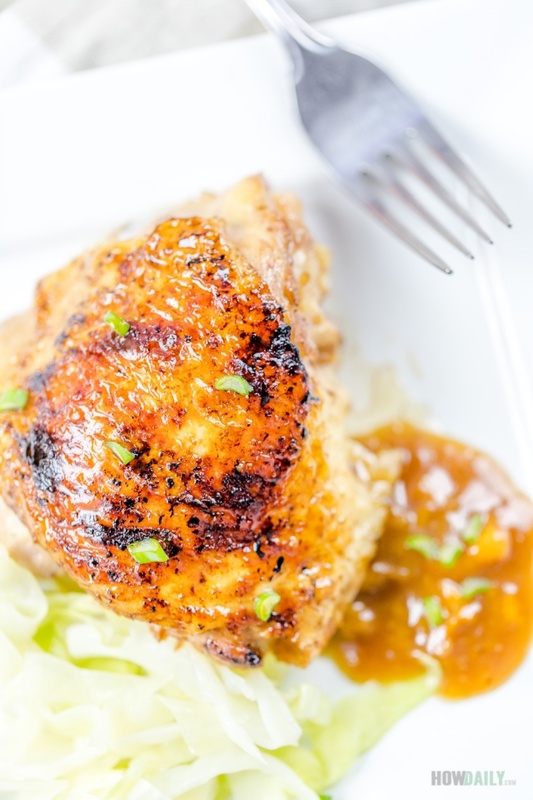 Tangy sweet hearty sauce over crispy skin chicken thigh, this is the best of the best. Try this recipe with your regular salad, potato or rice. Extract coconut juice into a pot, add chicken and bring to boil. After boiling chicken for 10 minutes, transfer the meat into marinade pot, reserve the boiled liquid and set aside. 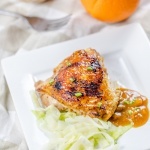 Marinade boiled chicken with 2 Tbsp soy sauce, 1/2 tsp ground pepper and 1 Tbsp honey for 30 minutes. Meanwhile, finely chop shallot and orange flesh into smaller chunks. Have a large sauce pan over high heat, when pan is hot, add 2 tablespoons of vegetable oil, stir to coat bottom. When oil is hot, pan fry chicken pieces, starting with the skin sides first and reduce heat to medium. When one side is brown, turn it over, repeat for other pieces. When all pieces are finished frying (i.e. golden brown on both sides), transfer to serving plates. With the same sauce pan over high heat, add finely chop shallot, stir to brown. Add chopped orange flesh into pan, stir until they are soft and shrink. Now pour in the reserved boiled coconut water. Bring to boil then adjust heat to low and simmer for 10 minutes and adjust with season to taste. Once this sauce is reduced enough, pour over chicken pieces and serve.